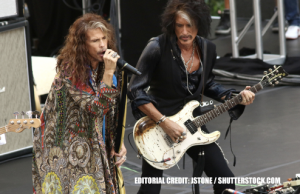 Aerosmith guitarist Joe Perry will embark on a headlining tour this fall in support of his new album, Sweetzerland Manifesto. The trek starts November 30th at the Anthem at Hard Rock Hotel and Casino in Sioux City, Iowa and includes stops in Detroit, New York City, Philadelphia and San Francisco. The tour wraps December 16th at the Canyon in Agoura Hills, California. Tickets for Perry’s fall tour go on sale October 12th at 10 a.m. local time. A pre-sale for those that subscribe to Perry’s newsletter or follow him social media begins today, October 9th. Special VIP packages will also be available starting October 10th. Complete information is available on Perry’s website. Perry released Sweetzerland manifesto in January. The rocker’s Hollywood Vampires bandmate, Johnny Depp, executive produced the record, while it featured guest vocals from Cheap Trick’s Robin Zander, the New York Dolls’ David Johansen and Terry Reid. Click HERE for more!